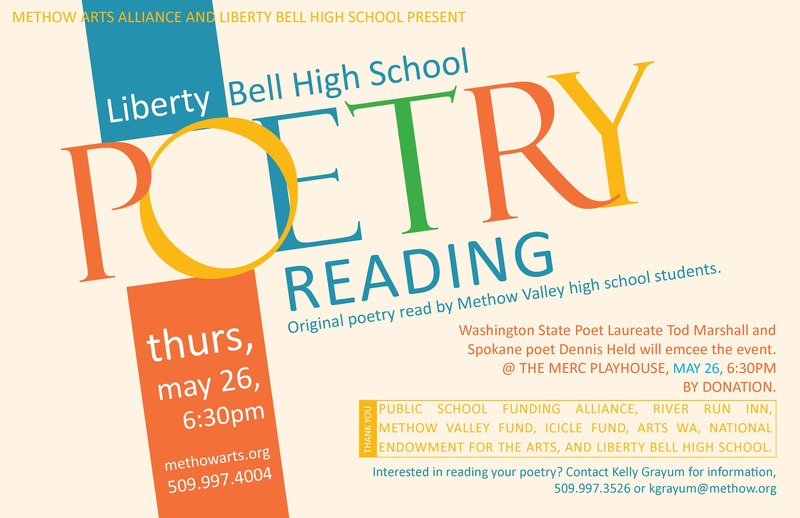 Liberty Bell High School students will read original poetry at the Merc Playhouse, after working with WA State Poet Laureate Tod Marshall and Spokane poet Dennis Held in their English classes. Marshall and Held will emcee the event and read some of their own poetry as well. Community members are invited to read original poetry this evening. If you’d like to participate, contact Kelly Grayum at kgrayum@methow.org or call 509.997.3526. This is NOT an open mic evening with spontaneous participation–please contact Kelly if you’d like to be on the schedule. Admission by donation. This event is presented by Methow Arts and Liberty Bell High School, with sponsorship from the Public School Funding Alliance, the Methow Valley Fund, Arts WA, National Endowment for the Arts, and Liberty Bell High School.